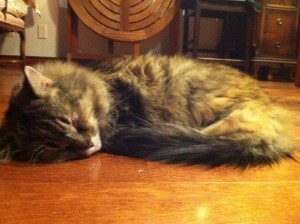 As many of you may know yesterday there was a 6 (ish) hour power outage. The shop was unaffected but my home was not and as it was my day off I found myself without electricity. Luckily not too long before the power cut, I had decided to stop all electricity dependent activities in favour of a nap. As I cuddled up on the couch with my fuzzy furnace of a cat the power went out which suited me just fine, I didn’t want to get back up to turn off the lights that had been shining directly into my eyes anyway. When I woke from the very satisfying nap (because my cat decided she was hungry and went in search of food, leaving me cold and alone), I noticed the power had still not come back on. Obviously I took this as a sign that I should spend the rest of the black out reading by the sunlight streaming in through the window. Hours passed without me noticing. It wasn’t until the sun had set and I could no longer see the words in front of me that I became aware again of my surroundings. Specifically of the candle stuck in the empty wine bottle directly behind me. I promptly lit the candle and moved it into a more convenient reading position. And then the book I was reading and the situation I was in said “Hey, think about this for a second, you’re gonna find it funny.” And I did. 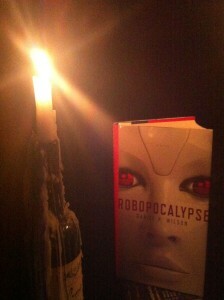 Robopocalypse is a very appropriate book to read by candle light. 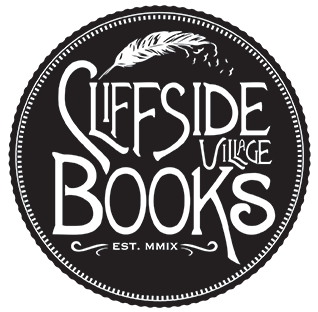 Have you ever found yourself reading a book that couldn’t be more suited to your setting even if you had planned it?